U.S. Secretary of State Mike Pompeo, holds a joint press conference with Qatari Foreign Minister Sheikh Mohammed bin Abdulrahman al-Thani, at the Sheraton Grand in Doha, Qatar, Jan. 13, 2019. U.S. Secretary of State Mike Pompeo said Sunday the U.S. will ask the Saudi crown prince Mohammed Bin Salman to make sure those who murdered journalist Jamal Khashoggi are held accountable for their crime. "We will continue to have a conversation with the crown prince and the Saudis about ensuring the accountability is full and complete with respect to the unacceptable murder of Jamal Khashoggi," Pompeo said Sunday after a meeting in Doha with Qatari Foreign Minister Sheikh Mohammed bin Abdulrahman al- Thani. US Secretary of State Mike Pompeo (L) and Qatari Deputy Prime Minister and Minister of Foreign Affairs Sheikh Mohammed bin Abdulrahman Al-Thani, hold a joint press conference at the Sheraton Grand in the Qatari capital Doha, Jan. 13, 2019. Pompeo flew to Riyadh after meetings in the Qatari capital of Doha, following stops in Jordan, Iraq, Egypt, Bahrain, and the United Arab Emirates during a weeklong trip of the Middle East. There he met with Saudi Minister of State for Foreign Affairs Adel al-Jubeir and Saudi Ambassador to the United States Prince Khalid bin Salman bin Abdulaziz. Pompeo reiterated the the importance of Saudi Arabia continuing its investigation into Khashoggi's murder. 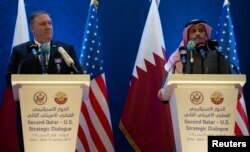 During the earlier joint press conference with al Thani, Pompeo urged the gulf countries to end a political rift in which Doha has been boycotted by neighboring former allies for months. "President Trump and I both believe the ongoing dispute in the region has gone on too long," Pompeo said. The U.S., which appeared initially to support the boycott when it began in 2017, has since been unsuccessful in negotiating between Qatar and the Gulf Cooperation council (GCC). All six member states of the GCC (Bahrain, Kuwait, Oman, Qatar, Saudi Arabia, and the United Arab Emirates) are United States allies. "We're hopeful that unity in the GCC will increase in the days and weeks and months ahead," Pompeo said. In June 2017, Saudi Arabia, Bahrain, the United Arab Emirates (UAE) and Egypt imposed sanctions on Qatar, accusing Doha of financing extremist groups and aligning with Iran, the Gulf Arab states' rival. Qatar has denied the allegations.